Devin Faraci is not here. Alamo Drafthouse founder Tim League isn’t here either. League’s usual introductory duties for opening night of Fantastic Fest were passed off to equally qualified but lesser-seen female staff members this year, after the revelation that League continued to employ Faraci in secret after sexual assault allegations forced Faraci to resign as editor of Alamo-adjacent movie site Birth.Movies.Death. (That’s the short version; you can catch up with our Newswire coverage of the situation here.) In the wake of the revelation, opening-night film Three Billboards Outside Ebbing, Missouri—which has themes of sexual assault—dropped out of the festival, attendees threatened to boycott, and many barbed insults were thrown around on social media. I, personally, didn’t boycott, not only because (to be perfectly frank) it was the week before the festival and travel arrangements had already been made, but because what always distinguished Fantastic Fest was its strong sense of community. That community has always been male-dominated—breezing past the long lines for the men’s bathroom is a cynical running joke among female attendees—but with a few notable and now highly public exceptions, not unwelcoming. Not attending would mean forfeiting something over which, in my fifth year at the festival, I’ve started to feel ownership, all because of someone else’s reprehensible behavior. A muted mood hung over the opening moments of the festival, and the lobby did seem less crowded than last year. But after the first few movies rolled, staff members brought out trays of pizza and chocolate chip cookies, the karaoke rooms opened, and it was back to business as usual. 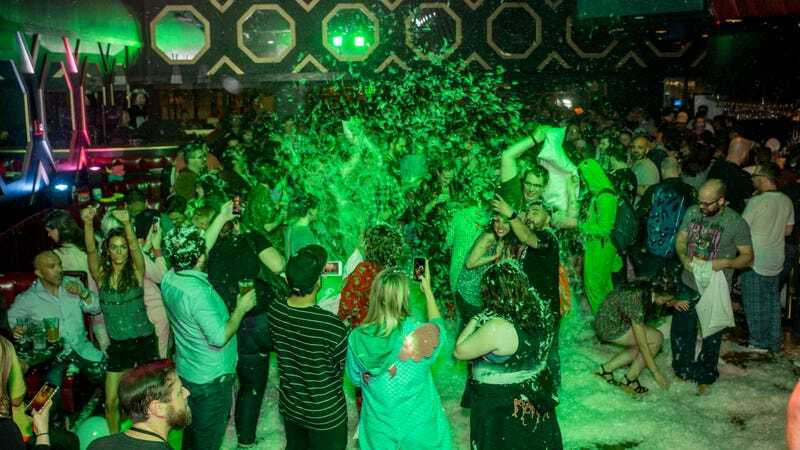 At Fantastic Fest, business as usual meant a floor littered with little white chicken feathers from an impromptu pillow fight, giving partygoers lucky (or unlucky) enough to be in feather-firing range the look of a guilty fox with feathers in their hair. It also meant a 10 a.m. press screening of a movie called Vampire Clay (C+), about—you guessed it—a cursed chunk of clay that feeds on the blood of unsuspecting art students. Directed by makeup artist and ABCs Of Death 2 contributor Soichi Umezama, the film sports practical effects that reach Brian Yuzna-esque heights of giddy absurdity, including a Claymation sequence of a teenage girl being swallowed whole by a wormlike monster as she squirms and screams. (Kudos to her—it must have been an excruciatingly tedious scene to film.) It also has some very silly teen-movie drama involving small-town sculpture students competing to get into an elite art school and more endings than the last Lord Of The Rings movie. It’s not a great film by any means, but it is the epitome of a “Fantastic Fest movie,” meaning enjoyed best with friends and a few drinks. The other selections on opening night were more traditional film festival fare: First was Thoroughbreds (B), which played at this year’s Sundance Film Festival and replaced Three Billboards at the last minute. The style on every level of Cory Finley’s film is crisp, from the precision editing to the stripes on co-star Anya Taylor-Joy’s shorts. Taylor-Joy plays Lily, a Connecticut teenager hiding toxic wells of hatred and resentment underneath a glossy rich-girl exterior; as the film opens, Lily has reunited with her childhood friend Amanda (Bates Motel’s Olivia Cooke), who makes no effort to hide her complete lack of emotions or conscience. The combination of the two, as you might have guessed, proves poisonous. Although I didn’t find the film as surprising as The A.V. Club’s A.A. Dowd did, it did manage to pull off the tricky feat of keeping the audience engaged with very disengaged characters; Cooke’s monologue about killing a horse was particularly chilling in its detachment. Perhaps appropriate for a relatively subdued opening, my last film on opening night of Fantastic Fest was another quiet affair. Rift (B-) tells the story of a broken relationship by way of a slow-burn ghost story amid the glacial landscape of rural Iceland; Björn Stefánsson stars as Gunnar, who rushes off to the cabin where he and ex-boyfriend Einar (Sigurður Þór Óskarsson) used to vacation together after receiving a distressing phone call in the middle of the night. The movie nearly grinds to a halt in its dramatic middle half, but kicks up the supernatural shocks in its last 20 minutes; these elements come together in a way that’s emotionally resonant, but will probably be too ambiguous for mainstream audiences. Director Erlingur Thoroddsen claimed in the Q&A that Rift—originally titled Twilight, and renamed for screenings outside Iceland for obvious reasons—is the first film made in his country to contain a gay romance, giving that aspect of the film a freshness that isn’t necessarily reflected in its horror elements.